While we waited for our water taxi, I had time enough to search out and photograph New Zealand bellbirds (korimako). 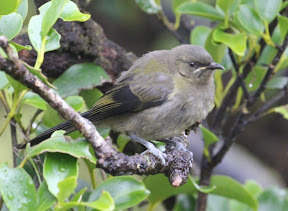 Along with tui, korimako are among New Zealand's most distinctive and charming songbirds. To hear their call is to be suddenly sure you are in Aotearoa. I was lucky enough to hear, see and photograph one near Freshwater Landing Hut. Our walk from the west of Stewart Island to Freshwater Landing had reminded me, yet again, that it's more about the journey than the destination. But once on board, and still basking in the satisfaction of seeing my first kiwi in the wild, I slipped into my default condition. 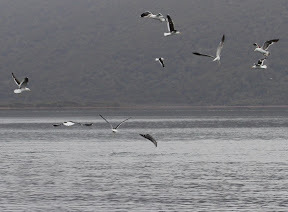 That is I sat in the boat and awaited our arrival back at Oban, as though there was nothing left of this journey; nothing but to travel over the sheltered waters of Paterson Inlet/Whaka a Te Wera back to our night's accommodation. Wrong again! Over the drone of the outboard I hear the skipper, Michael, saying something about dolphins. I snap to attention, and move nearer to listen and watch. As the boat approaches, Michael tells us it's actually a school of barracouta. Dozens of the large sail-finned fish are rounding up and feasting on bait fish, flying clear of the water's surface at irregular intervals. And as they hunt they are joined by a throng of squealing Pacific gulls and a handful of swiftly dipping terns. While the gulls concentrate on left-overs, the terns are actively diving, picking off panicked small fish from near the surface. One makes a shallow dive right in front of me, surfacing with a small wriggling fish whose jiggling tail is clearly visible. Above the plaintive mewling and raucous squabble of the birds there is the constant but unpredictable thrash of jumping barracouta shooting out of, then flopping back into, the deep grey water. I wonder what it must be like for them to break free of water's strange wet gravity, even for just those few seconds. How do fins trained to strain against wet heaviness feel in the unrestrained air? What do eyeballs used to darkly filtered light make of the sky's brightness? Somewhere in our dim evolutionary past some ancestral creatures began finding the answers to such questions, and must have liked them enough to stay. As our boat putters along we soon notice other birds joining the hunt, including rare yellow-eyed penguins, and later some little blue penguins. The former are several times larger than the latter, but both sit log-like and awkward atop the water in between dives. A few years ago I had seen a yellow-eyed penguin walking down a beach in the Catlins. Its waddle towards the water made a duck look athletic. This time I spot one diving beneath the boat, its movements now graceful and fluid. It is flying as any bird flies, albeit in a denser medium. Its body anatomy is adapted to suit, with short, strong wings and dense insulating feathers. 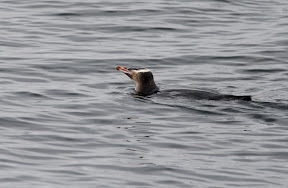 Because of its diet it also has plenty of omega-3 fat on board, doubtless helping with insulation. And, come to think of it, who ever heard of heart disease among penguins?